N.B. I offer a conflated reflection for both the 7th Sunday of Easter and the Ascension Sunday for the simple reason that in the US, what is celebrated on May 16 is the 7th Sunday, while in many other places, the Ascension Sunday is celebrated. 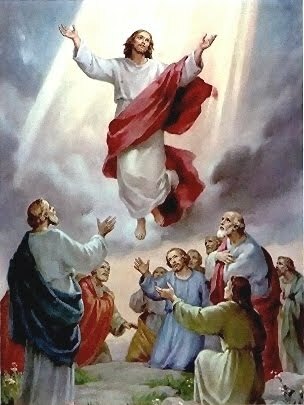 The liturgies of the Ascension of the Lord and the 7th Sunday of Easter both have to do with going beyond, with transcending the reality of the here and now, and with moving onto a realm qualitatively and patently different from current mundane experience. They both speak of the ultimate reasons and foundations of our earthly hope – the glorification of the Risen Lord, a promise and foretaste of what God, in His love and wisdom, also has assured us in His Son, Jesus Christ. Yes, the fact that “God mounts His throne to shouts of joy,” and that “the Lord is king, the most high over all the earth,” ought to make us pause in hope and in avid expectation of the Lord’s promises to all who love Him. No matter where we find ourselves in, in whatever hemisphere we happen to live in, whether in the affluent and wasteful first world, or in depressed and developing third world, all of us long for this newness, for this “freshness deep down things,” for total renewal that goes beyond mere cosmetic and shallow changes in all aspects of our personal and societal lives. We long for newness that extends beyond a change of leadership, or one that makes economic and financial affluence or security alone sound so shallow, if not hollow. We know deep inside our hearts, that there is more to life than just getting what most people all over the world spend so much of their time and energy for. We want more than just a big beautiful house, a fleet of nice cars, mere popularity, or the trimmings and trappings of earthly power and fame. Surely, on both sides of the Pacific, in the Philippines and in the U.S. in this election year 2010, the electorate shows or has shown and still shows, the changing value systems that seem to point happily toward this evangelical and biblical newness that stands out of the liturgy in these recent weeks. Where I am right now, the media frenzy about all sorts of scandals (on all fronts and sectors of society, not excluding the churches) has caused such a falling out in terms of the perceived high moral ground that both Church and civil society are supposed to champion. In the Philippines, the bitter pre-election battles fought less by honorable statesmen and more by seasoned traditional politicians who hide behind their puppets of a candidate have shown all too clearly the need for a massive change of heart, a massive renewal of mind and heart with regard to the way we as a people envision and live democracy concretely. Sadly, the electorate from both the enlightened and the less enlightened camps, have seen once more, how selfishness and greed, and naked ambition can make people throw all semblance of morality out the window of opportunism and raw manipulation, capitalizing on poverty and ignorance as the only sure-fire stepping stones toward power, wealth, and unlimited influence over others that go along with them. In my country of birth, the irony about a very rich man spending billions to tell the electorate how “poor” he is, is lost on the many poor people he claims to be fighting for. On both sides of the Pacific, people are realizing that strong rhetoric alone, and histrionic denunciations of massive cheating alone, and even undying promises of a better life for teeming masses of the poor, don’t make for a credible high moral grounding on which to base one’s bet to being catapulted into power. People are looking for a new politics of sincerity, for a new form of governance based on concrete acts that uplift society, especially those who are the part of what Blessed Mother Teresa calls the “the least, the last, the lowest, and the lost.” In the Philippine context, people have grown tired of the now “old tactics” of so-called “people power,” prostituted once too often by shallow and hollow men of doubtful moral bearings, who would do anything just to put and maintain themselves in power. Where I am, the growing realization of the futility of war seems to be taking hold. In a land where everything seems to be politicized, where even moral principles become a matter for both parties to take sides in, where the voice of moral reasoning and moral reflection gets drowned out by partisan politics, people are waking up to the reality that elections are not a simple matter of just rooting for a candidate or for a party, but something that ought to be elevated beyond the level of shallow partisanship. People begin to realize that listening to the voice of objective morality does not necessarily have to follow the lines of either of two (or more!) parties locked in an epic struggle for supremacy. In other words, people are realizing that the choice between life and abortion, between war and peace, is not something that ought to be tied to the rhetorics of a particular candidate, running in the name of a particular party. The reason is simple: moral issues are just that – moral issues, not political issues that ought to be made cannon fodder for any party’s political arsenal. I am an avid follower of the elections both in the Philippines and in the United States. I see the ebb and flow of the tides of support for this or that candidate. I see the disappointment and disapproval as the case may be, for one or the other, or for the whole lot of supporters and “king makers” who work behind the scenes – those who have hidden ulterior and selfish motives behind such sycophantic show of undying political support, no doubt to their later advantage. I see changes. I see hope like the distant rays of a rising sun, breaking out of the shadowy peaks yet enveloped in darkness, but which contains a certain promise that cannot be thwarted even by the lowering clouds of turbulence and thunderstorms of any magnitude. Is there ever a more compelling reason than this for us to keep on hoping and setting our sights on things that are above?